One hundred percent. That’s 100% of the net profit proceeds of the sales from the Tiffany Save the Wild Collection will be donated to support the anti-poaching, anti-trafficking and ivory demand reduction projects around the world through the Elephant Crisis Fund (ECF), an initiative of Save the Elephants and the Wildlife Conservation Network in partnership with the Leonardo DiCaprio Foundation, supported by #KnotOnMyPlanet. Tiffany has long made environmental causes and support of non-profits an integral part of its extensive sustainability program. It has been working with the Elephant Crisis Fund for a couple years. Last fall Tiffany donated an elegant $120,000 elephant clip from the Schlumberger collection made of gold, platinum, diamonds, gems and enamel to a benefit auction for the ECF. To promote the charity and guide donations to knotonmyplanet.org, Tiffany engaged photographer Dan Jackson and stylist Alastair McKimm to shoot the piece on several models including Racquel Zimmerman, Julia Nobis and Imaan Hammam. 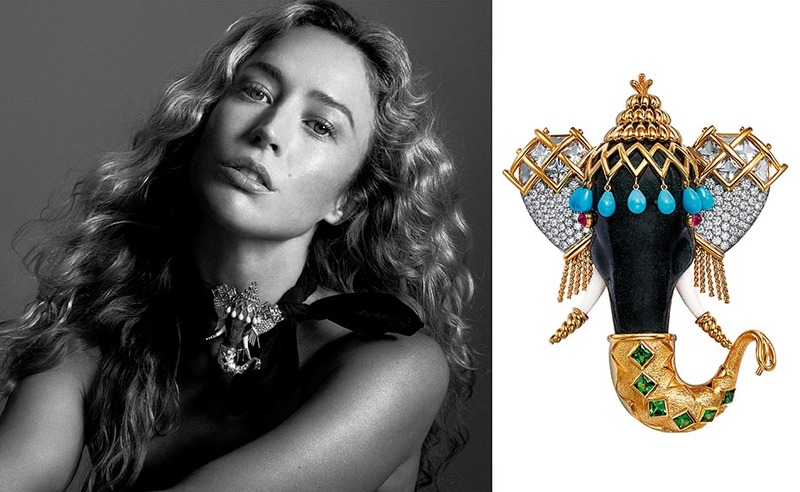 Raquel Zimmerman wearing the Tiffany Elephant brooch by Schlumberger donated by Tiffany to a benefit ECF auction. Photo by Dan Jackson and courtesy of Tiffany & Co. 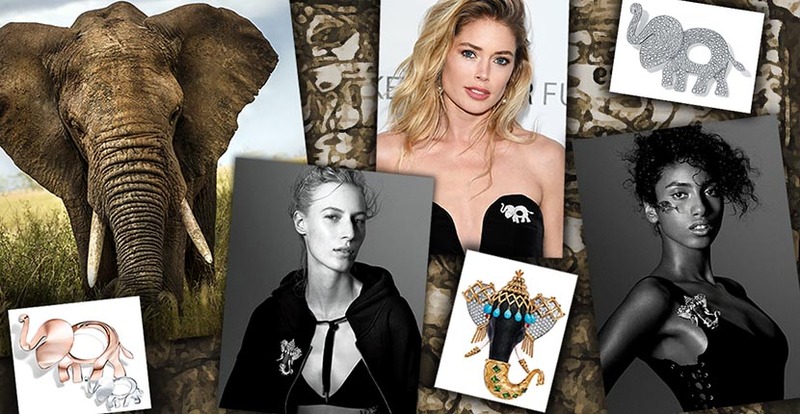 This year Tiffany has made it possible for any number of elephant lovers to support the cause and represent the beautiful creature in their jewelry collections with a series of elephant brooches and pendants. The Save the Wild Collection has prices ranging from $150 for a little silver pendant charm set with a tsavorite to $20,000 for a diamond and gold brooch. Model Doutzen Kroes has worn the diamond rendition of the brooch several times including to the fourth annual Leonardo DiCaprio Foundation Gala in St. Tropez, France on July 23, 2017. Doutzen Kroes wearing a diamond and gold Tiffany Save the Wild brooch at the fourth annual Leonardo DiCaprio Foundation Gala in St. Tropez, France on July 23, 2017. A pink gold and diamond and silver tsavorite brooch from Tiffany’s Save the Wild collection. 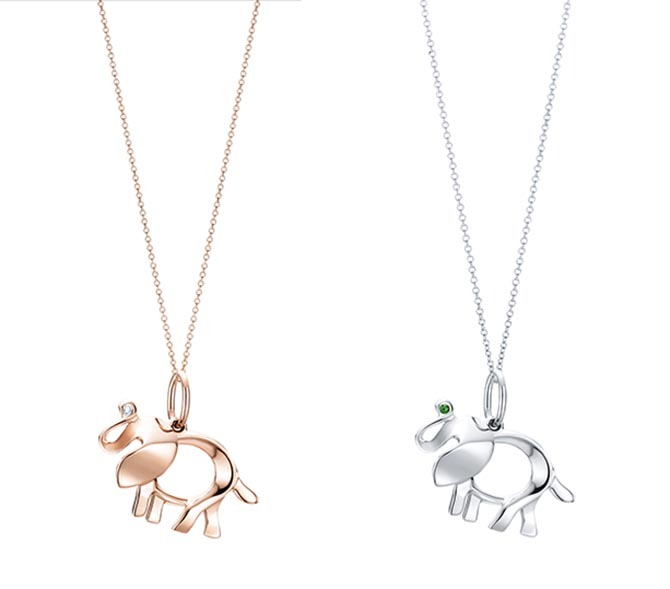 Photo Getty Images and courtesy Tiffany & Co.
Tiffany Save the Wild Elephant charms in rose gold and diamond and silver and tsavorite. Photo courtesy of Tiffany & Co.